Gorgeous 1 bedroom, 1.5 bath villa at the SeaCrest Oceanfront Resort. 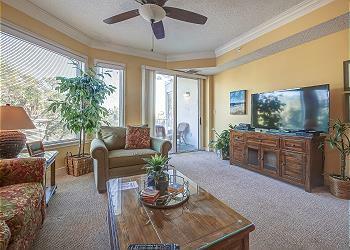 Beaufitully decorated and close to everything Hilton Head Island has to offer. This villa is in building 2 on the fourth floor at the popular SeaCrest Resort. The fully-equipped kitchen offers new stainless steel appliances and a breakfast bar with seating for 4 which opens to the dining area with seating for 6. The tastefully decorated living area offers premium tiled flooring, a large flat screen TV and king sofa sleeper. The king bedroom boasts a large walk-in closet, lovely bathroom with walk-in shower, garden tub, and double vanity. The private balcony is perfect for relaxing outdoors. This villa’s location and tasteful decor make for the perfect vacation spot.